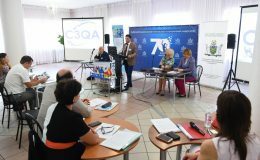 The 1st training within the 1st Year of the Erasmus+ Project on “Promoting internationalization of research through establishment and operationalization of Cycle 3 Quality Assurance System in line with the European Integration (C3QA)” took place between June 4th – 6th, 2017 in Kyiv, Ukraine hosted by the project partner Kyiv National University of Trade and Economics (KNUTE). 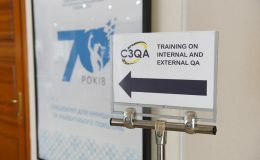 The training session was aimed at elaborating External and Internal Quality Assurance of Cycle 3Programs through the fact-finding results identified by the Armenian, Mongolian, Ukrainian, and Kazakh representatives as well as integrating the experience of doctoral studies and QA systems adopted by the French, Spanish, and Polish academic contexts. 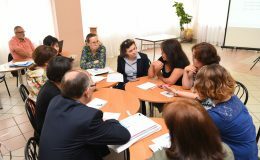 The training was launched by the opening speeches of Mr. Anatolii Mazaraki, Rector of KNUTE, Mrs. Svitlana Shytikova, Erasmus+ Ukrainian National Erasmus+ Office and Mr. Arayik Navoyan, Coordinator of the project, Vice-rector of UFAR. ng – After the opening ceremony the participants were presented to the state of affairs regarding the C3QA Project’s achieved outcomes addressed by the project EMT. Afterwards the partner country representatives from Armenia, Mongolian, Ukraine, and Kazakhstan presented the outcomes of the fact-finding exercises highlighting their national frameworks, laws, guidelines, as well as statistics, strategies and funding mechanisms related to Cycle 3 and Quality Assurance (QA) of Cycle3, challenges, trends and peculiarities typical of each context. 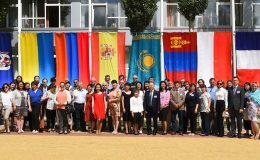 aining day was designed to present the experience of doctoral studies and QA systems in French, Spanish, and Polish academic contexts by comparing them to the already identified challenges of the Armenian, Mongolian, Ukrainian, and Kazakh doctoral studies. The presentations were later followed by 2 workshops in parallel subgroups in order to practically reveal the national and context based challenges and solutions on the doctoral studies and QA systems in the partner countries. 06 June – morning – The 3rd training day continued the practical aspect by holding 2 more workshops in parallel subgroups so as to better integrate the best practices of each partner country. 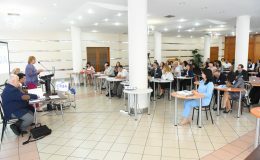 The culmination of the training was the Coordination meeting organized by the project’s EMT that addressed major issues on the project’s 1 next activities, deliverables and timeline of 2017 activities, the Project’s financial and administrative management, details on the equipment purchase and delivery to the project’s partner countries, as well as organisational issues on the improvement of the Project communication. The Project’s Coordination meeting was summed up by approving the line of actions for the upcoming activities and setting the synthesized timeline and respective deadlines in terms of the Alcala workshop in Spain, equipment delivery, staff costs and elaboration of the working toolkit. At the closing of the Coordination meeting Mr. Arayik Navoyan thanked all the participants for their presence and active contribution, as well as thanked KNUTE representatives for the successful organization of the Kyiv training.